Not far from the administrative center of Guiyang, capital of southwest China's Guizhou Province, sits a vast complex, the Guiyang International Eco-Conference Center. Forty percent of its main building is covered by greenery, while the roof supports more than 100 solar panels, which not only power the building but also provide all of its hot water. The building is the venue for the Eco-Forum Global Annual Conference. The topics on the agenda of the three-day event range from forest cities to poverty alleviation, green finance innovation, ocean conservation, bio-diversity in economic development, mitigating climate change, environment and health, and wilderness restoration. The first annual conference of the forum took place in 2009 under the name Eco-Forum Guiyang, but was upgraded in 2013 to Eco-Forum Global as a national and international event held by the Chinese Government. In a congratulatory letter to this year's conference, President Xi Jinping stressed the high importance China has attached to the protection of the ecological environment and the country's willingness to continue efforts to implement the 2030 Agenda for Sustainable Development along with the international community to build a clean and beautiful world together. Like many other countries, in the process of economic development China has been plagued by ecological issues such as environmental degradation, pollution and the exhaustion of resources. In addition to providing a platform for countries to exchange their ideas and practices on eco-civilization, the forum is also a window through which the outside world can learn more about China's efforts and experience in this regard. Guizhou is a mountainous region and one of China's poorest provinces. While eager for economic takeoff to lift more of its people out of poverty, it is also under huge pressure to protect its natural environment and prevent the desertification of its rocky karst landscape. Preserving natural resources and an unspoiled environment while simultaneously transforming these resources into profit for local people is the main challenge facing Guizhou. 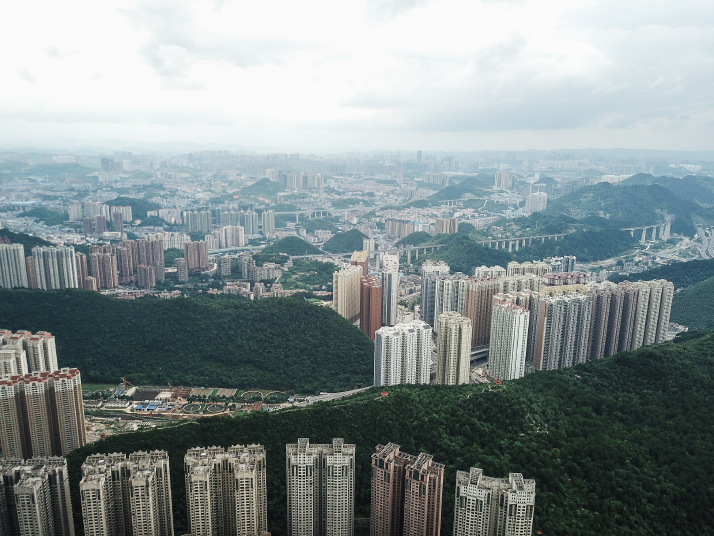 Guiyang was bestowed the status of a "national forest city" in 2004 by the State Forestry Administration and boasted an urban forest coverage of 48.66 percent in 2017, with two forest belts around the city and 942 parks. Zhao Deming, Secretary of the Communist Party of China Guiyang Municipal Committee, said at the forum that the city plans to plant more trees while protecting existing forests, as well as increase its overall forest coverage to 60 percent with a per-capita public green area of 12.88 square meters. The International Eco-Conference Center is not the only green building of its kind in Guiyang. Surrounding it are a number of hotels and other skyscrapers constructed in the same style. According to the Guiyang Housing and Urban-Rural Construction Bureau, this low-carbon technology is to be applied widely in residential buildings as well. The city is not only surrounded by trees but blended with forests and wooded hills. The famous Qianling Park is perhaps Guiyang's best example. The park is situated in the heart of the city allowing easy access for most of its residents. At 1,200 meters, the hills are well-known for the hundreds of macaques who live there. Local residents often go to feed the monkeys, and familiar with the presence of humans, the macaques accept and even request food from visitors. 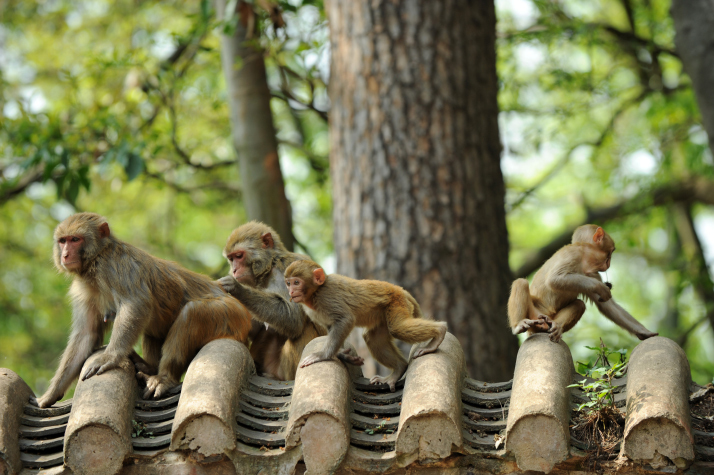 From the early 1980s to now, the number of macaques in the park has risen from 30 to more than 500, and the harmonious scene of monkeys playing with humans is now a common sight. Yet this is but a small part of the city's environmental journey. In the 1990s, far from being considered a forest city, Guiyang was notorious for its acid rain, the levels of sulfur dioxide in the air exceeding the national limit due to high-polluting industries such as coal and phosphate mining, cement and steel production, and thermal power plants. Ironically, the level of the city's economic development at the time was among the lowest of China's provincial capitals. 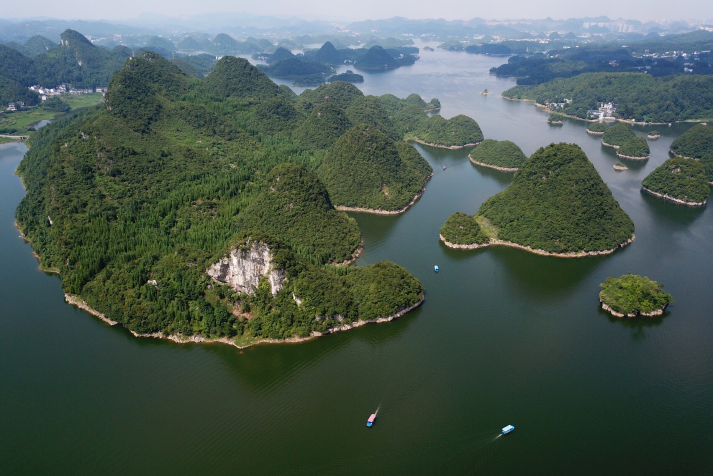 The ecological fragility of Guiyang's karst landform means that once the surrounding landscape has been damaged, it is extremely difficult to restore to its original state. Geographic remoteness hindered economic growth, and while the region boasts many natural resources the delicate nature of its ecology makes them difficult to access. The provincial government decided to place equal emphasis on growth and the environment to avoid the negative effects of industrialization. So far, all coal-fired boilers in Guiyang have been installed with desulphurization, de-nitration and de-dusting equipment, while high-polluting operations, like cement factories, power plants and steelworks, have been moved out of the city. In 2004, Guiyang released China's first local ordinance on the circular economy and in 2013 China's first local eco-civilization regulation took effect in the city, providing an environmentally focused legal basis for activities such as crop burning, emissions, river management and urban construction. China's first environmental protection court was established in Guiyang in 2017. According to Han Deyang, President of the Guizhou Provincial Higher People's Court, the court accepted 1,020 criminal cases related to natural resources and the environment from June 2017 to May 2018. At the Eco-Forum Global, Han emphasized parity between the judicial protection for the ecological environment and natural resources in the province and the protection of citizens' personal and property rights. Today, children in Guiyang's kindergartens are taught how to contribute to environmental protection. Zhang Jianhui, a teacher at the Guiyang Preschool Education College, is the first professional educator on environmental protection in Guizhou. Since 2000, she has been engaged in training preschool teachers in green education and organizing activities at kindergartens for children and their parents. Her efforts have helped environmental concepts to spread from the kindergartens to families, communities and wider society. Zou Lianke, Director of Guizhou's Department of Education, said at the forum that ecological advancement is inseparable from education. Environmental education from kindergarten through primary school, middle school and university is crucial to raising the awareness of future generations to the importance of ecological protection. Students in the province are widely encouraged to participate in ecological and environmental protection classes and activities. The achievements of Guiyang's efforts to protect the environment are significant. From 2013 to 2015, the city's air quality excellence rate jumped from 76.2 percent to 93.2 percent, ranking fifth among China's provincial capitals, while its forest coverage rose from 39.8 percent in 2007 to 45.5 percent in 2015. In 2017, the city's air quality excellence rate hit 95.1 percent, ranking ninth among all the country's 74 major cities. As an inland province, Guizhou's economic growth lags behind the country's coastal regions. By the end of 2017, of the province's 35 million inhabitants, 2.8 million were yet to escape poverty across 65 counties, 14 of which were considered to be extremely impoverished. The province is also home to the upper reaches of the Yangtze and Pearl Rivers, and so any change to the ecology of Guizhou could have a major impact on the areas along these two waterways, which are important arteries of China's agriculture and industry. For some time, Guizhou pursued rapid economic growth through extensive development, only to find its economy hindered further by a degraded environment. This heavy toll awakened provincial leaders to the necessity of green development, which balances economic growth with resource preservation and environmental protection. Guizhou is home to vast underground caves, sheer limestone peaks, rocky gorges and cascading waterfalls—the most famous of which is China's largest, Huangguoshu. Meanwhile, almost 36 percent of the province's population is made up by ethnic minority groups, whose ancient traditions, customs, architecture and cuisine hold unique appeal to visitors. However, due to poor transportation, most areas have until recently remained largely untouched. In the past five years, the provincial government has invested more than $100 billion in the construction of infrastructure. In 2017 Guizhou received more than 744 million tourists, contributing more than $110 billion to the local economy, with more than half a million people lifted out of poverty through tourism. Since 2014, Guizhou has also been promoting itself as an ideal location for big companies to store vast reservoirs of data. The province's geography gives it a mild climate, with minor temperature fluctuations throughout the year and an average temperature of about 20 degrees Celsius in summer. This means a constant supply of cool air to servers housed in data centers, thereby reducing their energy consumption. So far, Guizhou has attracted tech giants including Apple, Alibaba and Amazon, and more than 8,900 big data companies have settled in the province to date. In the Baihuahu Township of Guiyang's Guanshanhu District, 95 percent of residents were relocated to higher land in the mid-1960s when their then homes were submerged to make way for a reservoir that is today's Baihuahu Lake, a source of drinking water for the city. The reservoir is dotted with 108 rocky islets covered by dense forest. But despite the breathtaking scenery, strict environmental rules prevent local residents from haphazardly developing lake-side tourism. Some farmers living along the reservoir have started agritainment businesses, but these are permitted only after more than 90 percent of these houses' sewage and trash is covered by centralized treatment processes. Yet those who do not live along the lake must find other sources of income. For many years, local villagers have toiled their limited arable land for meager returns as most of the youth headed off to the cities to look for jobs. Even today, the township is still struggling to shake off poverty. The local climate and soil makes the area well-suited for planting tea, and the village has a tradition of tea cultivation. In July 2017, with the support of the local government, Baihuahu Eco-Agriculture Development Co. Ltd. entered into a joint eco-tea plantation program with the Guizhou Zheshang Group. The plantation uses only natural fertilizer—fermented livestock manure—and pests are not killed with chemicals but manually by workers. Local farmers can invest in the plantation by using their land as shares. The Zheshang Group is responsible for identifying markets while Baihuahu Eco-Agriculture Development takes charge of specific business programs. Given that tea plants do not produce anything for the first three years and farmers have nothing to rely on for income once their land has been repurposed for tea cultivation, the program provides an annual subsidy of 600 yuan ($89) per mu (1 hectare=15 mu) to farmers, while every 10 mu of land provides a job for a farmer watering, weeding and protecting the plantation from insects. Chen Qiong is a farmer in her mid-40s from Wenshui Village in Baihuahu Township. Her family has contributed 35 mu to the tea plantation, and the land will thus bring the family a net income of 21,000 yuan ($3,120) a year. Two family members are currently working there, which means a monthly income of 4,000 yuan ($594), and she expects her son to return from temporary employment in the city soon to work in the plantation too. Before they joined the tea cooperative, the family had to rely on farming to make a living. "We did have enough grain to eat but the corn was not enough to feed the pigs at that time. We had to borrow money from relatives to buy fertilizer, let alone put aside savings", Chen told Beijing Review. A turning point came in October last year, when the tea plantation began to bring them a stable income. "We all hope to see the tea garden develop so that we can make more money and live a better life," Chen said. The exodus of large numbers of young people has been a serious issue for China's remote areas in the southwest. Tea plantations like the one in Baihuahu Township, however, are an alluring alternative for a number of young people in these villages. "When the program first started, most workers in the tea plantation were aged 45 or so, but since spring this year workers in their early 30s have begun to outnumber the older ones", said Tang Yao, Manager of Baihuahu Eco-Agriculture Development. According to Tang, the company is planning to set up tea-processing facilities, making a variety of products such as green tea, black tea and matcha. "When that happens, more people will be able to find a job without going to the city, and can take care of their children and home". Tourism, green agriculture and big data innovations are manifestations of the province's willingness to develop the right way, with locals themselves exploring ways to improve their living conditions. "We'll stick to the policy of poverty-alleviation combined with ecological protection, and the road to green development. Poverty-stricken areas will be left with enough ecological resources for sustainable development. By no means will we build our economy at the cost of the environment," said Wu Qiang, Vice Governor of Guizhou Province, at the Eco-Forum Global.